Puppy strangles (aka juvenile pyoderma and juvenile cellulitis) is a serious dog skin condition that affects puppies 4-16 weeks of age. Some breeds of dogs are more susceptible to this condition. This page looks at the symptoms, causes, and treatment of this puppy skin condition. Juvenile cellulitis, juvenile pyoderma, and puppy strangles all refer to the same skin condition. The exact cause of juvenile cellulitis is not clear. Many vets suspect it to be an immune system abnormality. Most cases of puppy strangles are an inflammatory immune process of unknown cause. In other words, the puppy’s immune system is attacking its own skin! In some rare cases, puppy strangles are caused by bacteria, but this is the exception rather than the norm. Puppy strangles affects young puppies between 4 and 16 weeks of age. It usually affects several puppies in the same litter. It doesn’t normally affect adult dogs. Depending on how serious the condition, symptoms vary from just having a fever and swelling, to more serious conditions such as hair loss, swollen lymph nodes, skin ulcerations, etc. The puppy may start off having a fever, sometimes the temperature could go as high as 104°F. (Normal puppy temperature is around 100 to 102°F.) With such a high temperature, the puppy will understandably show signs of weakness and lethargy. He may also eat less or not eating at all. At this stage, if you take your pup to the vet, he may or may not be able to make a diagnosis. He may assume it’s an infection and just prescribe some antibiotics to lower the fever. Unfortunately, antibiotic treatment alone cannot cure puppy strangles. 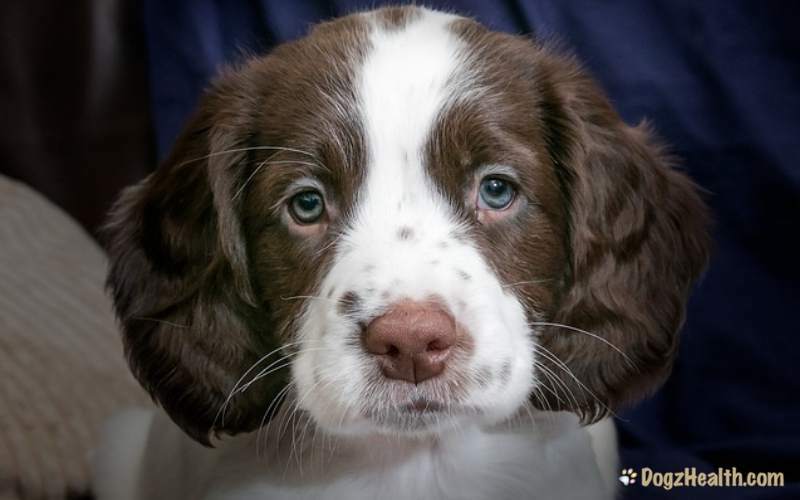 Therefore, if your pup has juvenile pyoderma, and is not properly diagnosed and treated, you will see sudden swelling on the face, lips, ear flaps, or eyelids. The puppy will rapidly develop pimple-like pustules. These pustules eventually rupture and bleed, forming skin ulcers and crusts. Usually, you can also find lesions on the inner surface of the ear flaps and occasionally in other body areas. These lesions can be painful. Also, there may be swelling and enlargement of the lymph nodes beneath the chin. Sometimes the puppy may have difficulty eating and swallowing because of the enlarged lymph nodes. At times, even the puppy’s joints may be swollen. Without any treatment, serious scarring and permanent hair loss can result. In addition, puppies with juvenile pyoderma can be quite sick and the condition can be life-threatening. 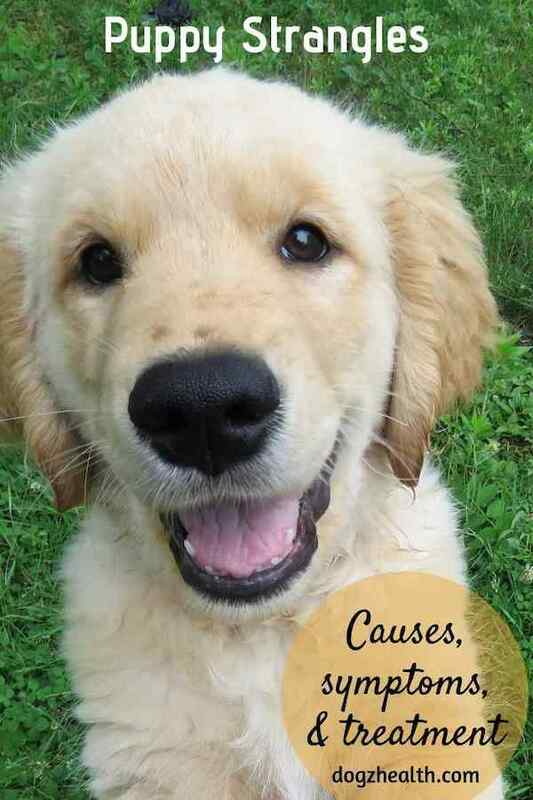 If you see some of the above symptoms in your puppy, get him to the vet for treatment immediately. Do not try to squeeze the pus from the sores! Scarring will likely result if you do so! A vet usually uses a skin biopsy to diagnose this puppy skin condition. Because this condition is believed to be an immune-mediated disease, i.e. the puppy’s immune system is overly-active, high initial doses of oral corticosteroids (such as prednisone) are usually given to suppress the immune system. When the puppy’s condition starts showing signs of improvement, the vet will decrease the dosage of corticosteroid in about 14 days. The vet may also prescribe topical steroid ointment to help heal the lesions and alleviate pain. In most cases, the puppy will respond after several days (3 to 5 days) of treatment. The condition generally resolves in 10 to 14 days. If the puppy’s condition doesn’t improve soon, the prognosis is much poorer. Steroid treatment cannot be stopped abruptly even if you see improvement. So, the treatment normally continues for 4-8 weeks, with gradual tapering of the dose. If there is secondary bacteria infection, the vet may also prescribe a short course of antibiotics. He may also suggest using an antibacterial soap or surgical scrub (e.g. 2% chlorhexidine) to wash the puppy’s skin. Relapse of the condition after treatment is rare.